Enjoy the Gulf views from the 3th floor at the Inn at Summerwind Resort "Just let Minnow". 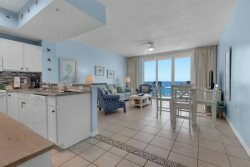 This east corner unit has a fabulous view overlooking the island. The master bedroom has sliding glass doors that lead onto the Gulf front balcony. The bedding in the condo consists of a king sized bed in the master bedroom, queen sized bed in the second room, and 2 twin beds in the third bedroom. Add the sleeper sofa and this comfortable unit can sleep up to 8 guests. The master bathroom has a whirlpool tub. Loved our stay, will stay again. Ease of booking, loved the view from the room, all around great experience! If someone told me they were going to that part of Florida I would recommend Navarre Properties. The only drawback of the property was not being able to see the ocean from the pool deck. The staff was very helpful, professional, and pleasant to interact with.